Hi! How are you? How have you been? Anything interesing on the agenda? I have never written a review on troches (throat drops) before, but I tried this one today and it was, I must say, quite interesting. Now all that fusion, new-exciting-flavours, "strawberries and balsamic vinegar", let's-explore-the-flavour-of-umami is old news. Everywhere people are trying to come up with new, trendy combinations of familiar things (or unfamiliar things too for that matter) to broaden the market and the potential of dull items. Crisps now have to taste of mozzarella and chorizo, or you need to reconsider what you really value in life. Parma ham mashed potato with a parsnip foam? Like pretending to appreciate the sensation of unleashing the full, brute force of a sleek sirloin braised in a simmer of kurrat and tsampa (beef fried with leek and yak butter). You know "feel the delight of local grown food, while exploring asian cuisine". Easier said than done. Though here, just a simple liqorice throat lozenge, slightly reinvented. Through easy steps, enhancing it with a bit of mint and pepper - and it's like a small step for lozenges, quite an interesting step for lozenge-kind. 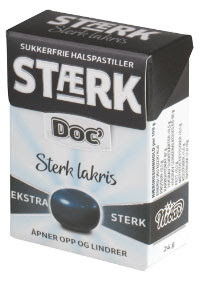 I wouldn't usually buy anything like this under the pretence of expecting it to taste good, it was all because the black coloured Stærk is delicious, but I was in need of variation. The Cayenne stærk is in addition a blushing red, and in fact one of those cases where all the food-hype might have worked. I say might because, this has been such a long and boring day, and the Stærk seemed to have been my only highlight since I was left here alone to rot. I would say they clear the throat, infuse your tastebuds with a not too peppery sensation, yet still feel very refreshing. It might not be worth it's price of 14,- for a whopping 25g, but then again everything sugarfree is usually overpriced. I have nothing else to say today. Maybe you would like it too? Hva skjer ellers Tora? Lenge siden sist! Bor du forresten fortsatt på lilleaker?